Horsehair braid is not just for hems! You can also use it in a neckline to add shape and structure. 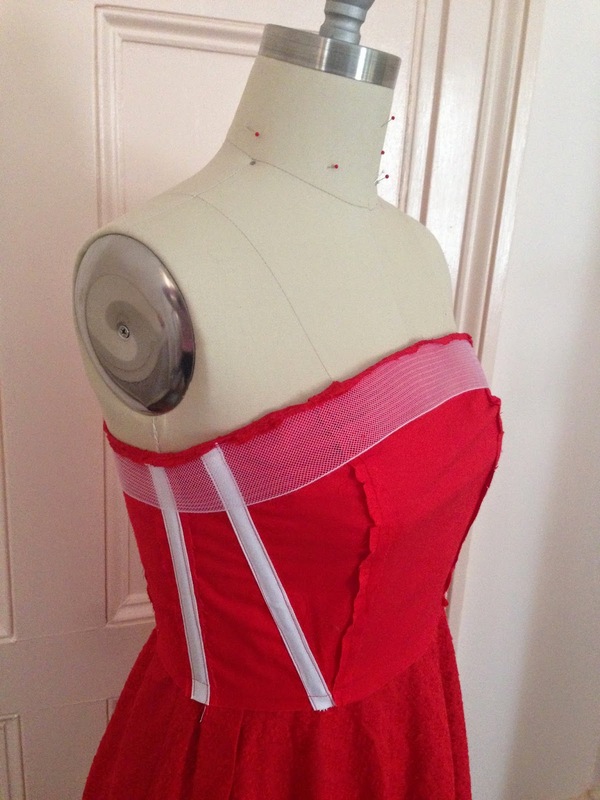 This works especially well in strapless or strappy dresses, where the bodice is supported by boning. Sometimes interfacing the neckline isn't quite stiff enough to stand up to the structure of the bodice, especially when you want a lot of shape and stiffness around the neckline. This red halter dress is a great example. As you can see above, it's boned around the bodice, but not over the bust. The horsehair braid keeps the neckline from collapsing above the bustline. It also keeps the neckline nice and crisp. 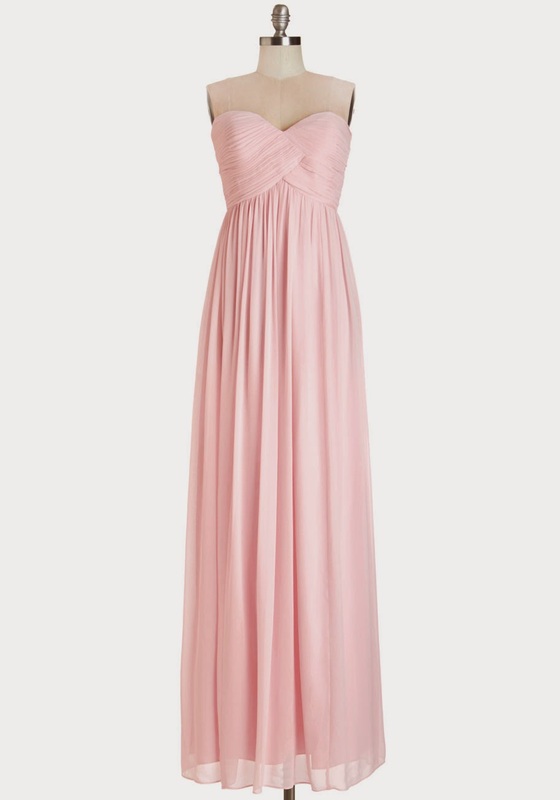 I've seen it used in dresses like this pink chiffon one, where you need extra structure to support the ruching of the lightweight fabric. To apply the horsehair braid, you'll want to stitch it to the lining neckline so that it's positioned just below the seamline. (Do this step after all lining seams are constructed and boning is sewn in.) Because my seam allowance is 5/8", I stitched my horsehair just a hair below that. The braid can go all around the upper edge of the bodice, or stop at the side seams, which ever you prefer. If you have it go around to the zipper opening, make sure that you cut it just short of the opening so it doesn't get caught in any seam allowances. Pull up the string in the horsehair braid so that it shapes to the curve of the bodice. It's a nice touch to stitch some scrap fabric around the short ends of the braid so the cut edges don't poke through the dress. Stitch the bodice to the bodice lining, right sides together. Understitch the lining, catching the horsehair braid and the seam allowances in your understitching. Turn the lining to the right side and press, and there you have it! A nicely shaped neckline. I had no idea horsehair came this wide!!!!! It's stupid how excited this made me!! I texted my husband at work to tell him because I just wanted to share my excitement with someone!!!!!!! He was less excited. Um, make a nice strapless dress and THEN he will share your excitement! Works on my fiance, at least! This couldn't have come at a better time! I'm sewing a strapless gown (Vogue V1426) to wear to The Nutcracker and this advice will help to make it that much better. Thanks for sharing all your knowledge Gertie. 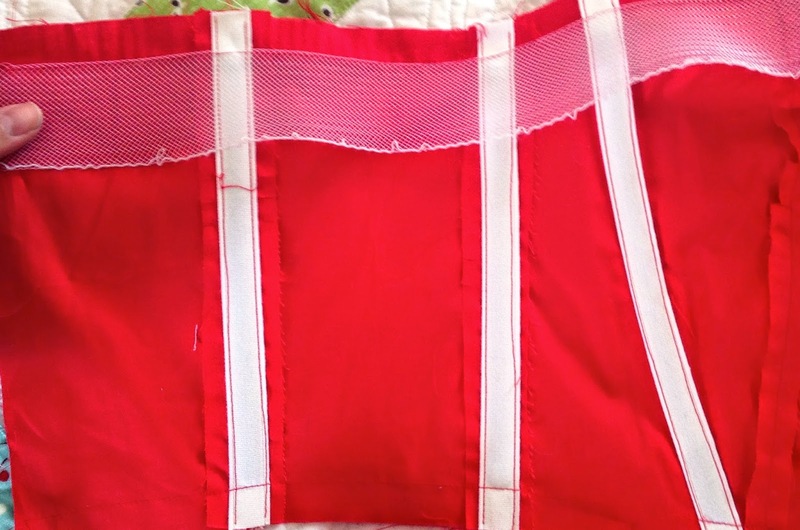 Thanks for this great tip Gertie, it's something I will probably do on future strapless bodices for my daughter. By the way your Butterick pattern B6094 Size 6 in the toile I made is an absolutely perfect fit on her. Thank you for the pattern. Making it in red silk dupion for Christmas. Dearest Gertie, thank you so much for this post! Your instructions are the best and right on time. Nicely done, Gertie. Thanks for sharing this technique. Great tutorial! I'm sure I could use it in so many instances. Thanks for the tutorial! I would never have thought of this! BTW, do you have a favorite online source for horsehair braid? I need to order some for a bunch of skirts, but none of my usual sources have it. Thanks! Great idea! I might be able to use something along these lines to fix a gorgeous ready made dress I have that just won't behave and keeps rolling over at the top of the bodice too. Thanks Gertie! 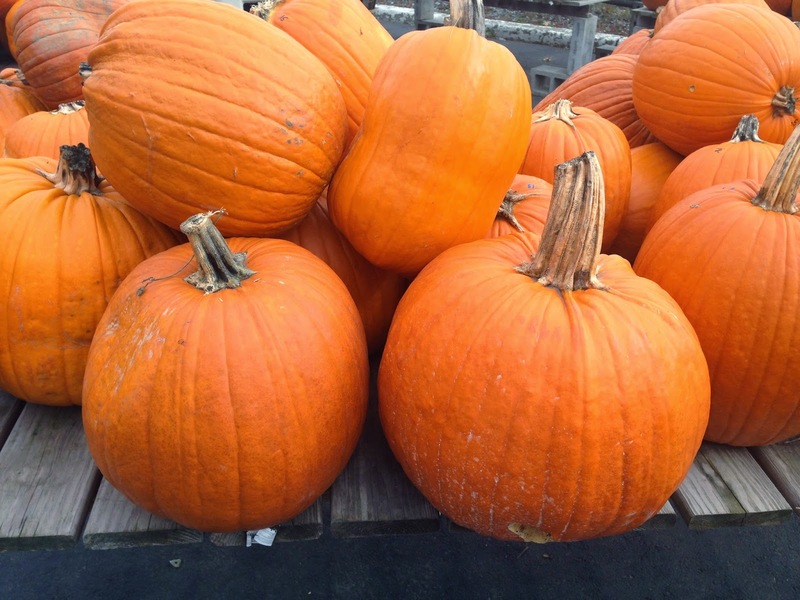 Your tutorials are the best and your information is always welcome ;) Happy Halloween! It seems a lovely, lovely halter dress. I want to see it whole! And, what pattern is it??? Thanks, I appreciate the tutorial! I was just wondering if the braid is itchy on the skin and requires lining or not? Does this technique also keep a strapless bodice from stretching? I have a strapless RTW dress made out of poplin that is at present unwearable because over the course of the day it stretches and won't stay up. I'm looking for a way to stabilize the top edge. Thanks for the tip Gertie! Thanks for this tip. I'm curious about how the horsehair gets caught in the understitiching with the lining and outer fabric seam allowances - if it's stitched just a hair below the seamline, it would be lying flat against the fashion fabric (outer bodice). 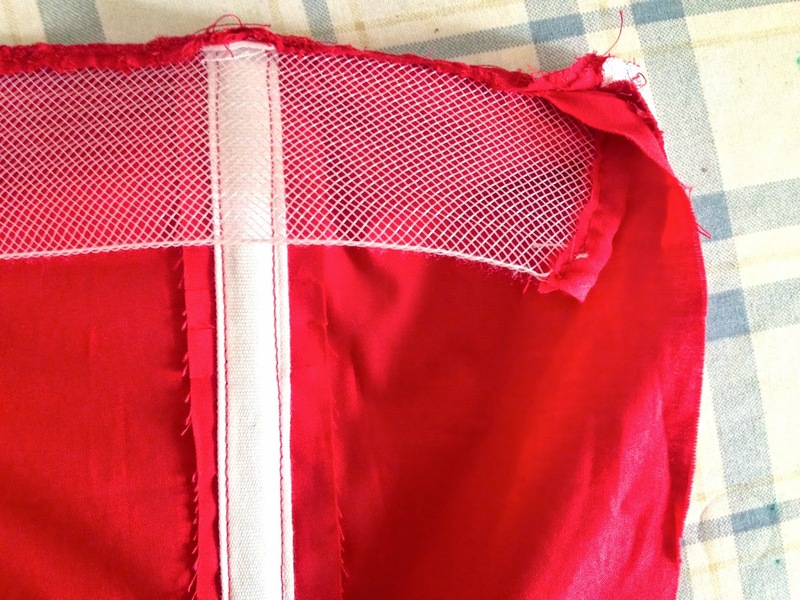 Understitching, as I've done it, is on top of the lining or facing, through both seam allowances, and allowing the outer fabric to remain free. It sounds to me like your instruction would have the horsehair folded back toward the lining, and that would create a bump at the seamline. What am I missing? 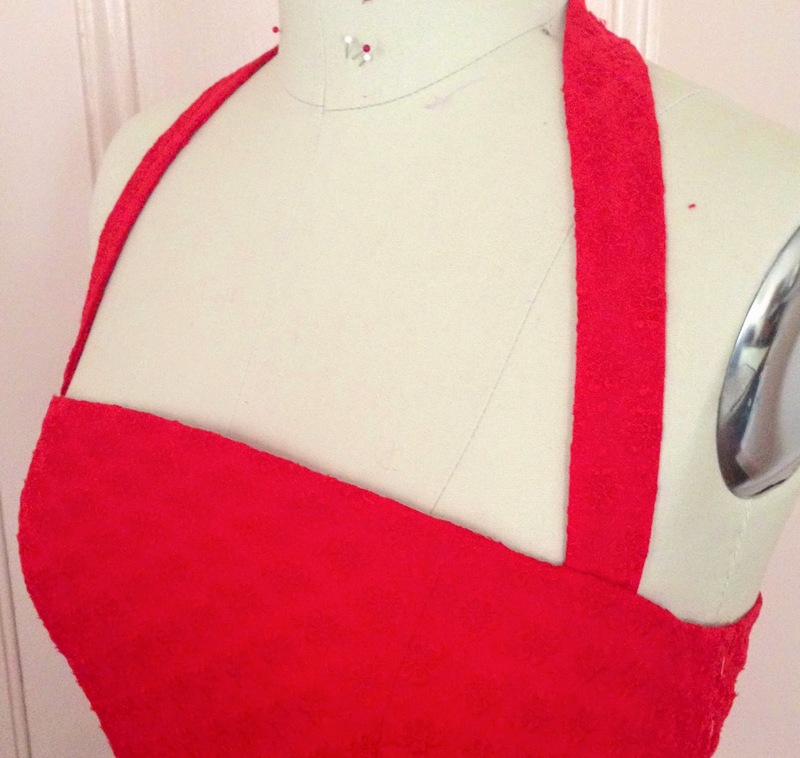 How do you get it to curve in the middle of the sweetheart neckline? Do you need to cut two different pieces? Janee the braid does sit entirely flat with no folds, the edge just buts up against the seam, just baste it to the lining or facing, then just understitch as normal. It's already in place and your understitching will still catch it as it is very close to the seam. There is no 'seam allowance' or any folding as such of the braid. Does that make sense? I think there's something I'm missing here. When you use the braid on hems, you tighten it on the top because the a skirt gets narrower as it goes up. But with a neckline, it's the exact opposite. Does the braid gets stretched on her own and therefore molds to the body?